We are camped in the Indian Creek Campground near Tecumseh, Michigan. We shopped at Cabela's last night and today went to Ann Arbor where we did some more shopping. Tomorrow we are leaving here and driving to Goshen, Indiana, where we will catch up on some maintenance on the apartments and visit with family. We have had a nice few weeks and saw a lot of country we had never seen before. I had never spent time in the UP of Michigan and it is quite beautiful. We got some great pictures of Lake Michigan and Lake Huron as well. We also spent time in our adopted state of South Dakota. We had originally planned to spend more time out in the Black Hills, but the 3-digit temperatures predicted scared us off. According to other friends who were there, it was quite miserable. So we have enjoyed mild temperatures on our travels. We will be in Goshen for about a month, then we will head to Virginia to see our grandson again. It is hard to stay away from him. He is changing so much every day. Fortunately, his other Grandma, Gr. Sharon, gets to see him a little more frequently and keeps me updated and sends me new pictures. He is one loved little guy. Well, well, well. I can't believe it's been so long since I posted. Ugh. We left Sioux Falls and drove to Morton, Wisconsin, to an Indian Casino campground. From there we drove to Minneapolis to another Indian Casino. In case you are seeing a pattern here, you ARE. The pattern is not that we gamble a lot (we don't). It's just that the Indian casinos generally have nice campgrounds and they are usually very reasonable. Terry took me to the Mall of America. I had never been there and I had always wanted to see it. We walked the ENTIRE mall. It really doesn't look much different than any other, except for the amusement park in the middle, but it is much, much larger. When Terry had been there years before when he was working, the mall was out in the middle of nowhere. Not so now. We also spent some time at IKEA which was right across the street. We also visited Camping World and Cabela's while we were there. We had a very nice time. Once we left Minneapolis, we headed across Minnesota and into Wisconsin. What a nightmare. Wisconsin doesn't have many campgrounds that will accommodate 40 foot motorhomes. Oh, they SAY they will, but they just can't. We have several scratches to rub out on the sidewalls. The problem is that once you start down a one-way road that is very narrow, there is no way out except to keep going. We finally did find a nice campground, but had to drive several miles out of our way to get there. It was north of Green Bay, near Crandon, Wisconsin. Leaving there we headed to the UP. We camped in the Island Resort and Casino campground in Harris near Escanaba, Michigan. Another nice campground for $15 a night. Once we left there, we headed across US2 to St. Ignace, Michigan. Last night we camped on the northern shore of Lake Michigan within sight of the Mackinaw Bridge. This morning we traversed the bridge. I am not thrilled about crossing bridges. I love to view them, but would just as well take a land route. That was really not feasible. At least when we left this morning, the wind was extremely calm and there were no waves at all on the straights. It was an enjoyable crossing and I was glad to be on the other side. We came down US23 along the eastern side of Michigan along Lake Huron. We stopped at one roadside park right on the water and visited with another couple who were "camped" there. The fellow was an enjoyable guy who snorkles the waters and looks for rock formations that are remnants of the ice age. He talked at length about how the great lakes were formed and how the "pudding" rocks were created. Then we talked about the bridge and he was amazing with his facts about how far the bridge can sway and how far it can bend in. He said it would take roughly a 600 mph wind to blow it down. . . in other words, it ain't gonna' happen. We drove on looking for another campground and passed several up before stopping at AuGres, Michigan. This is city park and we have full hookups. It is $26 a night, but only 30 amp. We found out last year that Michigan has increased their camping fees and the state parks are really quite high. One we stopped at was $26 for w/e, plus $8 entrance fee. And at that, the trees were a problem on the road. The private camps have for the most part increased their fees since they don't have to compete with the state parks. Makes it an expensive state for the occasional traveler. We are headed down toward Dundee tomorrow to Cabela's and we do have a Passport Park reserved for tomorrow. Another wide open site so our Datastorm will work. Have had problems getting open sites! On the way to Sioux Falls, we drove through the town of LeMars, Iowa, which bills itself as the Ice Cream Capital of the World. It is the home of "Blue Bunny" ice cream and they make more ice cream there in one day than anywhere else in the world. It takes 75,000 cows to produce the milk needed on a DAILY basis. Wow. That's a lot of cows. We arrived in Sioux Falls, South Dakota, on Thursday afternoon. We had a list of things we needed to do and so we got set up at the fairgrounds and proceeded to run into town and started checking things off the list. We had to go to the Treasurer's office to change some boat trailer titles to SD. We got in there and there was a pretty good line, so we were prepared to wait. They had 12 windows open and we were surprised when a lady came out of the office and called to us. In addition to those 12 windows, they had several more people in the office and we got right in. It took less than 20 minutes to get Phaeton Place's plates and the Sport Trac's plates renewed and get new titles applied for on the boat trailers and their plates as well. Then we were off to Alternative Resources to get our mail and to the insurance agent in the same building to pay some insurance. We didn't have to go to SD to do any of these things, but since we were there, we were able to take care of them. We met at 9 am Friday morning with our attorney who is adding some amendments to our wills and trust to make them legal in South Dakota. We are using the Thompson Law firm and they are very good. Very personable and we feel we are going to enjoy our association with them. There is a Honda Gold Wing rally in Sioux Falls over the weekend, so the fairgrounds was filling up with attendees and vendors who were in town for the festivities. We drove on down to the Falls Park, where the rally is being held and strolled around the grounds. When we were last here, we visited the park at night, so it looks a lot different during the day. We left Sioux Falls Saturday morning and drove to the Jackpot Indian Casino in Morton, Minnesota. We met the neighbors who are "Teton" people. Got a beautiful Teton 5er and were very friendly. We were chatting after supper before we went over to the casino. Our dogs were outside and Neal had a seizure. Because of that, we had to wait a couple hours until we knew the danger of his having another seizure had passed. Neal was a real trooper and we managed to keep it down to just the one. We left about 2 hours later and went to the casino. The slots here are really tight. We had gotten some free money for camping in their park and I got $5 because it is my birthday month. We both spent our free money and $5 more a piece. In less than an hour we had lost that. We don't mind losing, but I at least like to be entertained. This didn't even qualify for that. So we left. I stayed up till midnight keeping tabs on Neal, but he was fine. Today we went back and tried again. We had free money again. . . good thing they do this, because we wouldn't be playing here otherwise. Once we lost that, we were out the door. We went to the town of Redwood Falls and visited the Ramsey Falls in the city park. Very nice park and the falls were quite impressive in spite of the dry summer they are having. We also visited their county historical society which is housed in a building that was built as the "poor" farm. It is an impressive building and they have the various rooms set up to display period items. Later when we returned back to the reservation, we visit the Lower Sioux Agency Historic Site. It gives a history of the U.S.-Dakota War of 1862. It is a small museum, but well planned and gives a good description of life in the area during that time. Tomorrow we are leaving here and traveling about 90 miles to the Mystic Lake Casino area south of Minneapolis, where we are going to do some shopping and sightseeing. Last night we camped in the Fishermen's Corner COE park in Hampton, Illinois, near East Moline. 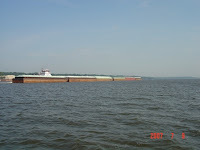 It is right on the Mississippi River and the areas along the river were very neat for the most part. They were nicely groomed and well kept. We drove up and down the river roads on both sides. There were a lot of tugboats with barges. This morning we went dockside at a small town north of the camp and watched this barge come through. Later we drove across into LeClaire, Iowa, the birthplace of Buffalo Bill Cody. They have a small museum there which contains memoribilia of his days with the Wild West Show. The home where he was born was actually sold at one time and relocated in Cody, Wyoming. They are trying to raise money to build a replica on the actual property. A homestead where he spent time in his youth is a short drive out in the country and they have buffalo in the field there. There is also an old dredging boat, the Lonestar, they have dry docked at the museum. They are raising funds to refurbish it. It was orginally built as a side wheeler, but was converted to a stern wheeler. We broke camp and drove over to the Amana Colonies in Iowa and are camped at the RV park there. The park is very large. . . over 400 sites with full hookups. They honor Passport America for 2 nights, so it's $28 for the 2 nights. We drove around the area, going through ALL the colonies, Amana, East Amana, Middle Amana, High Amana, West Amana, South Amana and Homestead. They were formed by a group seeking religious freedom. They were originally from Germany and bought land here to build their communal utopian society. The colonies are still owned by the Amana Society and it appears they have tight control over the maintenance of the communities to keep them as original as possible. In other words, you don't see Wally World or McDonald's on the corner here. It is actually quite refreshing and an historial bit of Americana you don't see anywhere else. I recommend visiting if you haven't done so. It is not crowded right now and you don't have to fight for space in the parking lots or the shops. One of the business started by the colonies was refrigeration and this is the birthplace of the Amana appliances. Whirlpool has now bought Amana and the people here are worried that Whirlpool will leave the area. Tomorrow we are going to visit a few more of the shops. Today it was the wine and cheese and meat shops. Heh heh. Many of you have been asking about Bailey, my black Scottish Terror. Apparently his lung disorder was pneumonia and nothing more serious. Well, pneumonia is serious, but treatable, and Bailey is responding well to the treatment. He is definitely acting more like his old self and eating well now. He barks occasionally, something he didn't do when he was really sick. I hope he continues to improve. I called the vet for an appointment this morning. They would see him at 9 a.m. I crated Neal and took Bailey in to the doctor. BTW, Bailey again ate some boiled hamburger and all 3 pills, stuffed into chunks of pork loin. Yesssss! The vet was very nice and Bailey was very good too. The vet wanted to do blood work. Had trouble getting blood out of both front legs as his veins kept collapsing, but he said that was typical of a sick dog. He finally got it out of his neck and Bailey didn't flinch. His regular vet says he always puts on a brave front. We went over treatment options. Clearly it could be pneumonia and the present treatment is appropriate. By eating now, it could mean he is feeling better and the meds are helping and will handle the lung. If he doesn't get better, we are probably looking at a cancer and he went over some diagnostic and treatment options. We had decided we would not do anything with that other than keep him comfortable and loved. I don't want Bailey's last days to be of pain, needles and strangers. He is 11, a purebred Scottie and while I know people with older Scotties, they are the exception. The vet called back later in the morning. Ruled out heart worm. Even though we have him on preventative, it was appropriate to test since my vet doesn't usually as long as we are diligent with the treatment. His white cell count is elevating, although still in a normal range, which I take to mean we probably got this fairly early--if it is pneumonia. We talked about Valley Fever in the office this morning, since we wintered in Arizona. Vet is somewhat familiar, but researched more and looked at a couple markers in the blood which are known to be affected by VF and nothing was out of the ordinary, so he didn't think that was necessary to pursue, unless I specifically wanted to. We left Arizona after February this year because we were TOO COLD, and I think we probably would have seen a problem before this. We are scheduled to leave for South Dakota Sunday and the vet didn't see a problem. Did ask me to stop by and get more meds as he thought 10 days was not quite enough. So he will get better this week and we know we are probably fighting pneumonia or he will get worse and we will love him as long as we can. We will watch him closely this week and see which way he goes. Bailey is currently sunning himself on the deck with Neal. It is warm but nice and cool in the shade. We have been back in Goshen/Elkhart for a week now and the floor in the kitchen at the house is done. It was supposed to have been done while we were gone, but the floor techhie didn't get to it. It only took 2 evenings. Terry went over and played "go-fer" so it saved the guy time reaching for material. The floor, which is a hickory laminate is absolutely gorgeous. It is far more beautiful than I had imagined it would be. We also put in new appliances and it is all put back together. I will post a picture later. . . I keep forgetting the camera. We have several long runners in there for Neal, our handicapped Scottie. He cannot walk on a smooth surface, so we decided to put in some rugs he could walk on. We leave Elkhart campground tomorrow. Phaeton Place goes into the Freightliner dealer at 7 a.m. for a scheduled service and I will take the boys over to the house. We will hang out there continuing to work on a couple things. New garage doors are scheduled this month and then we will be done for the year. . . other than just sorting through more junk! Sunday we leave for South Dakota. We are going "home" to get some legal stuff in order. We do have another problem that has surfaced. Our 11-year old Scottish Terror, Bailey, is sick. I had him at the emergency vets yesterday and his chest xray shows a right lung that is very sick. Could be pneumonia, which is what I am hoping. He won't, however, takes his meds. He refused food yesterday, but did eat a little this morning. I am going to try and get him into a vets here in Goshen tomorrow and see what else can be done. He is coughing up some foamy blood. Just had a visit from my parents. It was good to see them. It is nice to be close enough for family visits.